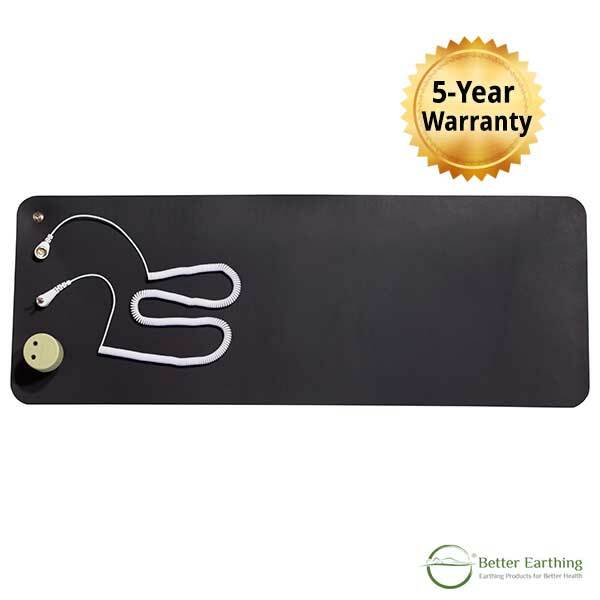 Our Better Earthing Mat is made from the highest grade solid carbonised synthetic rubber and is conductive throughout. Our tough, 1.5mm thick 100% carbonised rubber Earthing mat comes with a 5-Year Warranty. Protection from low-frequency EMFs from surrounding electrical appliances and wiring. 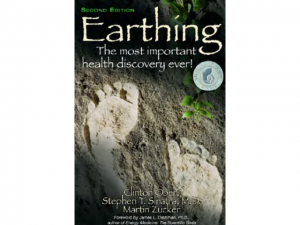 See our earthing benefits page for more info. 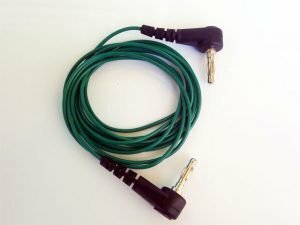 Comes with a COILED lead (if you would prefer a STRAIGHT lead let us know by leaving a note in the checkout), an AU/NZ green earthing adapter, and product guide. 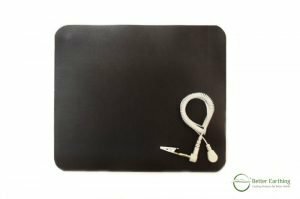 You can comfortably use your Better Earthing Mat all year round as this product works effectively through thin to medium socks or clothing as well as bare skin. The earth’s free electrons will pass from the mat to your body via the slightest amount of moisture in your socks and clothing, even in drier areas of Australia like Dubbo, NSW! 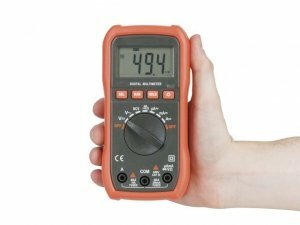 You can confirm this with an Auto-Range Multimeter. On or in front of your sofa – put your feet on it while you watch TV. At your computer desk; rest your arms on it. Put it on the floor beneath your desk, and place your feet (bare or with thin socks) on the mat. 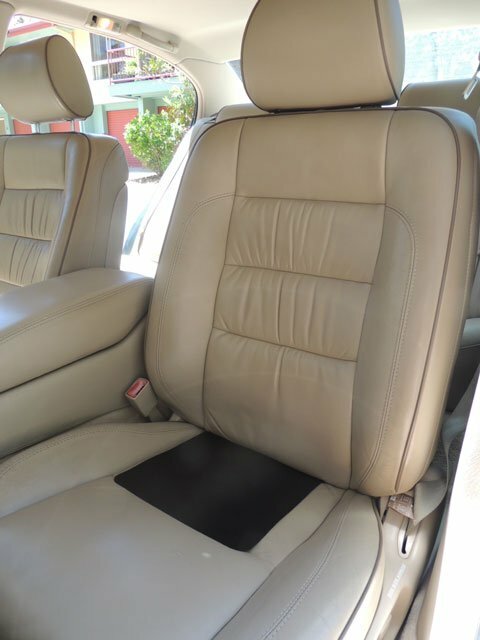 Sit on the mat while you relax in an easy chair. Better Earthing mats are conductive on both sides. One side has a slightly rougher texture so that the mat can ‘grip’ the floor and prevent slippage. People who use this mat while working at a computer for long hours generally notice they have less fatigue and more energy at the end of the working day. 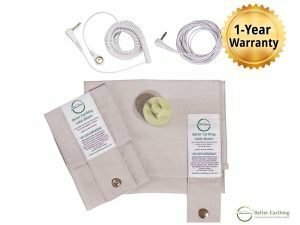 Better Earthing Mat (5-Year Warranty), Better Earthing Adapter & COILED Lead (2-Year Warranty), Product Guide. If you prefer a STRAIGHT Lead, please add a note within your order. Wipe down the mat with soapy water if the surface becomes sticky or comes in contact with skin lotions. This premium earthing product comes with a 5-year warranty on its earthing effectiveness, plus a 1-year money-back satisfaction guarantee. 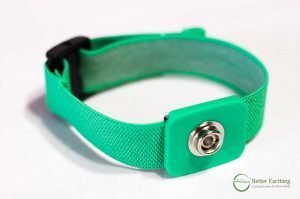 Be careful when choosing an earthing product, as most other earthing product brands come with NO warranty on how long they will earth effectively for. I couldn’t be happier with my two products (pad and mat). The most amazing outcome for me is a feeling as though my head and body and connected, meaning I feel like I am not always living in my head. Also I feel as though my nervous system has significantly calmed. I received my earthing mat promptly within a day of ordering and it is perfect. I have T2D and AF, both controlled by medication. With earthing I find that I sleep deeper and get back to sleep very quickly after the ‘reduced number’ of toilet trips effected by the mat (down from 7 or 8 to 3). I have also started dreaming again after many years of not since getting the mat. I believe this indicates more alpha rhythm sleep. Actually, I raised the bed head seven inches a month ago (see Andrew Fletcher’s site ‘Inclined Bed Therapy’) and this has reduced quite bad varicose veins to about 15% of their original size. The earthing mat is a good complement to the IBT. Thanks team! I have struggled with pain for more years than I care to remember. Especially in one of my knees. I have been for every test known to man and my only medical option is a deep and painful injection right underneath the knee cap for the foreseeable future in the hopes it would heal. My knee and spine used to keep me up for hours every single night. It would take up to three hours for me to finally fall asleep. Enter the earthing mat. Within one month of only 30 minutes a night I am now pain free in my knee and spine and falling asleep within 30 minutes of going to bed. My body is finally healing thanks to our beautiful earth and Better Earthing. The products I have are great quality, look good and really do work. They arrived packaged well with helpful information included. Postage was also really fast. Amazing results in my opinion from a fantastic product. I love my earthing mat – I have taken it to work and have noticed a definite increase in my levels of alertness, and at the end of a 4 day week I used to be shattered, now I can even contemplate going to the movies! If I come into work feeling tired, I ‘wake up’ not long after my feet hit the mat! I have also adjusted my diet in the last couple of months, however, apart from that I do think the mat has made a difference. I also feel a greater sense of wellbeing, and a lot less stressed. I am happy with my earthing mat and being a pretty healthy man I could not see much change but now after a few weeks I am finding I’m sleeping better and my right shoulder is not aching anywhere near as much so I have started doing lights weights again each day, Something tells me it must be working. Three months ago a suffered a sudden and major case of carpal tunnel syndrome after a heavy gym and weight session. 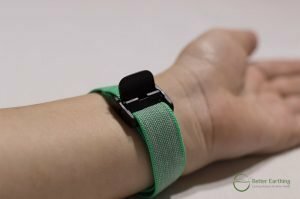 I suffered for almost two month wearing wrist braces and doing exercises but little changed. I then found your desk pad and have experienced a rapid easing of the symptoms. I still have slight numbness but have seen a major improvement in just two to three weeks. I’m saving for the bed sheet now. I am earthing all night and also when I am on the net. My blood pressure has improved, and so is my daughter`s, even though she is only using the mat when she is on her laptop. Ann had something on her back that had healed quicker than expected. So thank you. We are happy with the product. I had a big cleaning day and ended up with a huge very sore bruise at the base of my index finger! Decided it was time to test out the effectiveness of the earthing mat. I placed the mat on my lap with my hand sitting flat on it, about 10/15 minutes later, the pain was gone, bruise had completely disappeared in two days. The mat certainly passed the test! What can I say?….. your earthing products are FANTASIC! I have had a couple of injuries clear up and also a cluster of spider veins on my knee clear up dramatically since I’ve been earthing. This mat is great for computer work. Really helps with sustaining energy levels while spending long hours around EMFs. This mat is the best that I have tried and I have used two other brands. I use one under my desk chair and roll over it constantly without any bending or rolling over of the mat and with the others I have used I can’t say the same. This is a great mat that holds up and you can’t beat the thickness either. I have two and will probably order more in the future to put in other places of my home. This company cares about the products they put out. My arm and shoulder have been hurting (I broke my wrist last October and have a plate in it, and its still slightly swollen and been giving me curry). I lay down with the mat long ways under the side of my body and my arm. I thought I would leave it like that for ten minutes as I was reading a book. I fell asleep (bright sunlight coming in window in my eyes, hard to believe) I woke up an hour later, my shoulder was free from the pain for the first time in about six months. That’s when I decided to order the bed sheet! The pain has returned but I am sure once I start using the sheet it will go away for good. My concentration is much better with the earthing mat. I used to space out at the computer after about half an hour. Even though I wasn’t getting anywhere, I could not drag myself away. Now everything ticks over nicely. I use the earthing mat at work for a few hours each day in front of my keyboard on my desk, and rest my wrists on it. Work is so busy I don’t notice anything there. At home though in the evening I’ve stopping crashing / falling asleep in front of the TV round 8pm, and have more energy for life after work. It’s been like this for quite a few weeks now.